Your home can be your greatest asset in so many ways. Not only can it be a great long-term investment, you can also make money from your home in the short-term too. If you are looking to earn some extra money from your home with little to no hassle, then here are 3 great ways to turn your home into a regular income stream. Our first way to make money from your home is to turn it into a hotel for paying guests. Websites like Airbnb* offer many different ways for you to do just this. Firstly, you could rent out your entire home as a holiday let while you are on holiday or working away. This could be a great way to fund your own holidays or to get some extra income coming in. Another option could be to offer out single rooms in your home. This could be done on an accommodation only basis or even with breakfast included. Finally you could always separate off part of your home to offer as a year round holiday let. If you are a little nervous about turning your home into a hotel, then be sure to check out the earn money as an Airbnb host page* on the airbnb website, as this page may help in alleviating some common fears and it will also help you to see just how much you can earn as an Airbnb host. If you don’t fancy the idea of hosting guests in your home then have no fear, as you can still make money from your spare room by renting it out as storage space. We all know that house prices have gone crazy for decades now. This has meant that many more people are having to live in smaller houses or apartments, especially in big cities. While this can be bad news for some, it could be great news for you! If you happen to have a spare room, garage or attic that you would be happy to rent out as storage space, then you could solve a huge storage problem for those in your community who are desperately in need of it. As far as passive income goes, this is right up there on the list. If you like the idea of renting out some of your home as storage space for others then check out websites like Stashbee and Storemates. Do you have a parking spot, driveway or garage that you are not using? Why not make some money from it? High house prices have meant that some have had to sacrifice parking in order to afford to buy a house. There are now websites that will connect you with others to rent out your parking spot, garage or driveway. This should again allow you to create passive income from your home. If renting out your parking space sounds like a winner to you then check out websites like YourParkingSpace and JustPark. 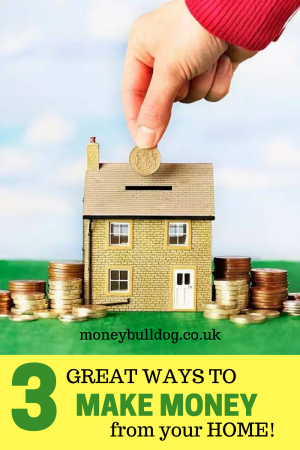 Here we’ve discussed 3 great ways by which you can make money from your home. Some require more effort than others but they are all excellent ways to turn your home into a revenue stream. While you could also do things like turning your home into a movie set or even hosting corporate events at your house, we think that the moneymaking ploys we’ve mentioned above will be the most realistic for the majority of people.